I am writing this blog entry due to my fanatic entourage losing control and jumping the gun a little bit with its recent report about the "BET Gospel Comic View" auditions. What was reported was accurate, but it left out enough information to cause confusion to those that like to have details. Also, it felt sort of like talking about a no-hitter at the seventh inning stretch to me, but enough folks have been emailing me questions about it, so I thought I would give a full report. There are three versions of the story below. First, the full A.D.D. reader's version. Second, the mild A.D.D. reader's version. And, third, the full, minute by minute journal of the entire event. If you read this version you are an official groupie! First, here is the ADD person's version. Skip down if you don't have ADD and read the full version, which is quite detailed and long. Major A.D. D. Reader's Version of the BET Gospel Comic View: A Time to Laugh Audition Story. I found out about an open call audition in Atlanta for TV show on BET. 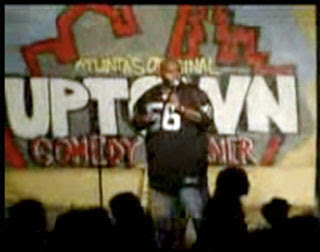 I blew up my 2 minute set in front of the historic Uptown Comedy Corner crowd in Atlanta. I felt like it was surreal. There is a good chance I will get selected to actually appear as a comic on the show. Most likely, part of my routine will be shown during the audition phase of the show like American Idol whether I get selected or not. Mild A.D. D. Version of the BET Gospel Comic View: A Time to Laugh Audition Story. Found out about an open call audition held in Atlanta for a new BET show that needs clean comics. Preferably the clean comics would also be appropriate for a Christian, gospel-themed show. LG, Corie Johnson, and I all went down for the open call. We then performed a 2 minute set in front of the live, Uptown Comedy Corner Audience in Atlanta. 24 comics performed, right in a row. LG, Corie, and Marty all had awesome sets. Afterwards, everyone agreed that all three of us had a legitimate shot at making it on the show. All the audition process (morning and night) was video-taped for television like the American Idol auditions. I had a very funny interview with the host, Vickie Winans, between the morning and night shows that could be used on television. There is a strong chance that each of our sets will at least make the television show even if we don't earn one of the ten featured spots on the show. The show will be a variety comedy show hosted by Vickie Winans. It will feature a few comics performing their five minute sets sort of like when a comedian performs on David Letterman or Jay Leno. We have not heard the official word on which of the 24 comics were chosen for the 10 spots available. That word will come down in the next few days or weeks. I felt like that 2-minute-set was probably the best audience response I have ever gotten. 3 of the staff members sought me out individually to tell me that they overheard the judges discussing how much they liked "the white guy." 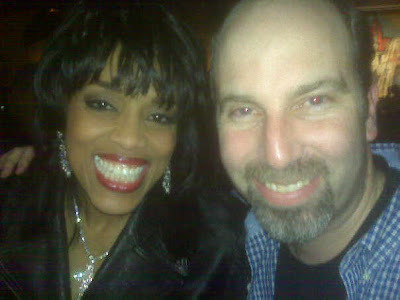 Vickie Winans came up to me after the show was over and was very encouraging. I geeked out and had my college roommate snap a picture of the two of us. That picture is my current profile picture on facebook. My Dissertation forNON-A.D.D Readers ::The BET Gospel Comic View: A Time to Laugh Audition Story. Here is the daily journal from the audition experience. WARNING: By reading this entire blog entry, you enlist yourself as and official "Marty Simpson & Friends" groupie! LG just sent me an email indicating to me that he and Corie Johnson may not be able to make the "Marty Simpson and Friends" show at The Garden Bistro on March 6th if they were to get a call-back on the Gospel Comedy Audition for BET network. Clicked the email's link included that showed the brochure to the comedy open-call audition. I just read the open call audition brochure and then emailed the organizers of the event listed at the site. I asked them if it would be appropriate for an inexperienced, white, comic to audition. "YES, IT'S OPEN TO ALL. NO DISCRIMINATION... IF YOU ARE FUNNY... YOU ARE IN!!!!" Decided that I am going to go if Ashley confirms my thoughts when I get home. Mentioned to Ashley about the audition. Said that LG and Corie are going and might not make the Bistro show if they get a spot. Showed Ashley the brochure in the email. She read it and said, "Why aren't you going?" I celebrated a little in my mind. Called LG and ask him to honestly answer a question for me. I asked him if he didn't want me going because he did not want to have me in the car with him for four hours driving him crazy. And was that why he didn't invite me to come? His response was, "No, man, we really didn't even think about it, and we figured you could not leave your job anyway." I found this response a tad entertaining. To not have thought about it AND to think I could not have left my job seemed a little on the impossible side, but I trust LG and I figured he simply was not worried about it one way or the other. He made it clear to me that I was welcome to come along. We decided that we were meeting at the Cracker Barrel on Bush River Road at 4:00 a.m.
Cleaned out the van so Corie and LG can each have tons of leg room. Took out one middle seat so the far back person has room to stretch legs all the way out. Moved passenger seat so the second back person has full room in the middle back seat to stretch out. I printed my material set-list to take with me. I got out all the clothes I was going to take with me in the morning so I would not have to get dressed in the bedroom and wake Ashley up. I took NyQuil so I would not toss and turn thinking about waking up at 3 a.m. I set the alarm for 3:00 a.m.
Just rolled over and looked at the clock. "Wow, I am wide awake and rolled over just in time to spare my wife from hearing the loud alarm." Alarm startled me and Ashley. I jumped and turned over. I forgot to turn the alarm auto-set off, which will prove relevant later in the story. Got dressed and got stuff ready to take with me. Thought to myself, "Maybe if we get called back from the first time-slot to a night audition we should take a change of clothes and some deodorant in case we have to get a hotel or crash somewhere." Decide not to jinx it and proceed with no more plans other than going to the audition. Set-out snacks, pop-tarts, and other things like headphones and stuff to take with me. Was scared she would see me so I pretended to be asleep on the couch. Peeked in Sonny's room to see that five dollars was left. Got in car without any of the above stuff that I had packed and backed the van out of the garage. Pulled my other car into the garage (only one car fits in the garage at a time) so Ashley and the kids would not have a frozen car to drive to school in 4 hours. Debated calling Ashley to have her meet me somewhere with the stuff. Laughed to myself about how stupid a thought that was. Texted LG : "I am in good shape on 4 o'clock arrival." Realized I was going to be ten minutes late. Hoped LG was late too. LG responded : "I'm good too." Pressed a little harder on the gas pedal. Arrive at Bush River Road Cracker Barrel. LG and I exchange pleasantries. Corie is nowhere to be found. LG is left with the impression that his call woke Corie up. LG said, "Man, let's leave Corie." I asked LG how far from the Cracker Barrel Corie lived. LG answered, "About 15 minutes..."
LG called Corie and said, "Man, where are you?" Corie said he is five minutes away now. 4:32 a.m. until 5:04 a.m.
LG rode Corie about being late. 5:04 a.m. until 6:32 a.m.
LG, Corie, and I all went over what each of us was going to do with our material. Corie asked what material I thought he should do. I told Corie I thought, "Definitely the faith bit." Corie responded, "That confirms it then!" 6:32 a.m. - 7:10 a.m.
Much silence is in the car. I am constantly praying a very specific prayer. "God, please allow me the savvy and poise to not have my usual diarrhea of the mouth. Please help me get my jokes out quick and sharp and to the point. Allow me to do my very best and not fall back on "treachery" mannerisms of over explaining. Help me listen to the audience, Lord. 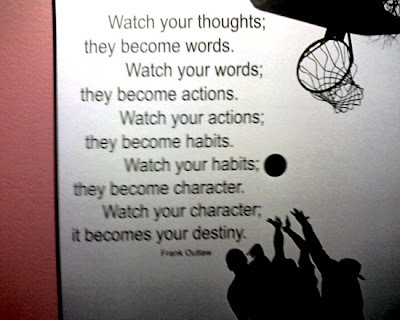 Help me be humble and continue to observe the surroundings react to them and not be controlled by them." I repeated this prayer at least 7 or 8 times. "Lord, let me be brief, elegant, and to the point. Lord, do not let me over explain...please." We were in stop and go traffic backed up. Pulled out material set-list to go over since we were stopped. Slam on breaks as Corie screamed, "aaayyeee, heeeyyyy, heeyyyy!!!!" Narrowly dodged a bus that was changing lanes while I was reading my set-list. Seriously, this bus just changed lanes assuming I had seen him start moving. My van was rolling forward at about 5 mph and it was in the middle of the bus length-wise. I really had to slam on the brakes to not get hit. 7:53 a.m. until 8:01 a.m.
LG rode me for almost hitting bus while reading my set-list. LG claimed he saw the whole thing happening and just was speechless. I liked Corie's response better! Arrived at the Uptown Comedy Corner. Noticed that the Uptown was between two strip clubs. 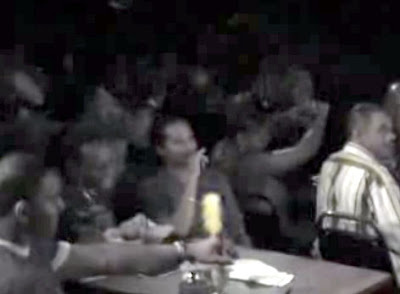 LG commented how he thought it was funny how the Gospel comedy auditions were between two strip clubs. Realize we are the first ones here and there aren't many people around yet. Corie and I start walking around looking for a bathroom. Corie stumbles over tiny rock in parking lot. Rolls on ground like a dying cockroach. I laughed and then found out that he was o.k. We make it across the parking lot to business complex. We go in and ask the lady if we can use their restroom. She glances at us and says, "Oh...no, we cannot let you in. We do a lot of government contracts and that stuff is all very confidential." I said, "Do you keep the files in the handicapped stall? Can't we just go to the bathroom?" She shook her head quietly. Corie and I go back to car. LG asked Corie if he saw him rolling in the parking lot. Decide I have to find a bathroom! Find another office in the complex that is open. 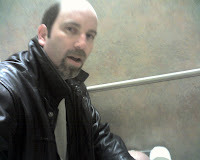 Text message a picture of me in the bathroom to LG. Ask LG if he got my message. BET arrives and starts setting up. Due to the cold, they allow us to come in and sit inside the club. 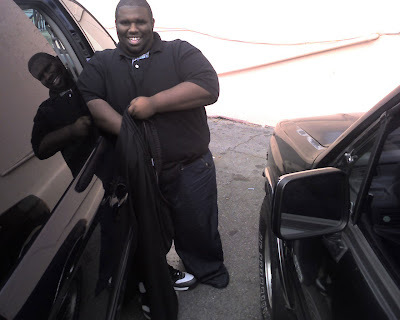 Corie decides to change his pants ... at the car! We start filling out paperwork. Other comics started filing in. Each one keeps looking at me as if I work here and asking, "So where do we sign up?" Everyone on the camera and grip crew is wearing cords and a black leather jacket. I am wearing cords and black leather jacket. Everyone on the crew is white. I am sincerely tempted to go over and put one of the 300,000 dollar HD cameras on my shoulder, film a few interviews, then take it to my car and drive home with it. Had I done this, no one would have even questioned me about it. We just learned that the only person ahead of us in the line was a kid that had never done comedy before. They assigned our numbers as 2, 3, and 4. That will be the order we will perform once we start. I feel really comfortable knowing that we will all perform together. It feels like a Garden Bistro show. Making small talk with other comics. We all are trying to pretend we care about each others’ stories. Have had to tell at least a dozen people where the bathrooms are because everyone keeps asking me things as if I work here. Just noticed one other white comic has arrived. Just found out that the other white comic had camped out right next to me at the Nashville Last Comic Standing Audition. He and I had a good talk. Crew member just announced to the group that we will be beginning our auditions in thirty minutes. Camera and audio crew members seem to have the entire place set up now. There are more than 70 comics signed up at this point. She announced that we will perform in the order of our numbers. The sacrificial lamb performer took the stage only to find that the microphone had only been set-up and tested to work with the camera equipment, not with the house. He is standing up there tapping the microphone while folks scramble up to the DJ booth to try and fix it. This really feels like they are icing him like an NFL coach would a kicker. I am growing more and more uncomfortable for him as he stands there and taps the microphone. The audio has been fixed. The producer instructed us to say our name and city into the mic, and then he would give us the go ahead verbally when we could begin. The first kid is awful. His content is about women in an inappropriate way and it's not funny. Opening Line: "Where are my ladies at, let me here you ... (cheers) I HATE ALL OF YOUR GUTS... ALL OF YOU!!!" When pronounced with the slang applied it sounds like Bussy-Baby. One of the more experienced, and NOT faint of heart comics in the audience really is getting on this kid. LG is primed to take the stage after the first kid. 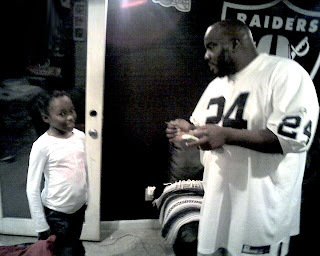 I lean over and tell him, "You know this first kid bombing like this is like a sacrificial lamb on your behalf, right? He is your angel in disguise. You have no excuse now!" As LG begins to take the stage he holds his hand out to shake the "bombers" hand and this kid is taking so much heat he doesn't even notice LG. The producer comes out and hollers for the kid to stay on stage. The kid is told that he gets to go again because there was an audio recording problem. The Big Funny Heckler starts yelling, "Do the same material, let's have more Bussy-Baby!! Please...!!!" The producer announces, "The comedians in the audience can laugh or not laugh, but please don't heckle the other comics." The "bomber" starts up on something as equally inappropriate as the first round. Heckler says, "More BUSSY-BABY PLEEEZZE!" "Michael Goodwin, Columbia, South Carolina"
Awkward pause for producer's go ahead signal. "Don't be alarmed, I'm not a Muslim...I just like bow ties"
He is going through his material like butter. He looks confident and poised. All the other comics immediately know that he is the real deal. I am very pumped for him. LG and I meet on the ramp to the stage. I give him the one hand shake pull in shoulder bump and say, "That was awesome bro! Great job...great job!!" I am still unsure as to what my first bit should be. I am on stage and it is my turn to perform! Instead of taking the mic and saying my name like they instructed us to do I began cleaning up. There were several pennies on the stage that I picked up and put on the first row tables. I slid the stool back. I leaned into the mic on the stand and said, "Don't mind me, I am just part of the staff." I pushed the mic stand back to its original place and straightened the cords. Moved a few other things briefly, then stopped, turned to the audience, hit a cheesy grin, and stepped up to the mic and said, "Nah man, I'm just playin' I am Marty Simpson, Columbia, South Carolina." The big heckler comic busted out laughing. He loved it. So here is my set as best as I remember it. Audience responses are in parenthesis. I taught school at a Christian, private school in Columbia, South Carolina for nine years. It had black students and white students, which is rare for a private school in South Carolina. We had 6 black kids at the school. I used to brag about how "diversified" my private school was. Don't judge me for being that way though. They will ask you, "Were there white folks auditioning..."
And you know you will say, "Yeeeaaahhh man...there were lots of white folks there..."
I don't know what the deal is but all I know is I have always just gotten along with black people. I have...and I really never knew why. But I have figured out why I get along with black people. Alright, pay attention white people, here is the code. No-no..no white folks, That's the whole code, that's it. You know, white folks and black folks worship differently too. You all know what a church-runner is? Well here is my impression of a white, Presbyterian, church-runner. That's my time y'all, thanks, I've been Marty Simpson. So God was saying to me, "Marty, the only way I can shut you up and get you to not over-tell your stories is to literally blank your mind!" AMEN!! The producers asked for all the comics that had performed already to form a line outside. They were going to shoot some cover shots and some interviews out there with Vickie Winans, the host of the show. My comedian friend and mentor, Horace H.B. Sanders, taught me that whenever I am doing an interview to make sure I "turn-it-on." Meaning, don't try so hard to NOT be funny that you succeed! He clarified that there is the natural you at a party that is low key and cool, and then there is the natural true you at the party when you are actually telling a story and stealing the attention from the room. Be that natural you once the camera hits you! My thought was always this. All my friends are always telling me, "Marty, just be yourself, don't worry about trying to be funny. Dude, just don't try to be funny and you'll be fine." My response to this line of thinking is simply, "I think ALL my friends underestimate how often I am actually trying to be funny!" I am like, "Dude, remember at that Valentine's party when I had you in stitches telling that story about my Christmas Eve craziness?" He is like, "Yeah, sure...that was hilarious." And I am like, "Yeah, I did that to you on purpose man..."
So, Vickie Winans is making her way down the row of comics in line and everyone seems to be going over the top with their comments. Everyone looks really put on. So I prayed. Horace also taught me whenever you have a doubt in your mind what you should say, you should be still and pray, and then most importantly LISTEN to God and to your surroundings. So, the comics next to me started chit-chatting and trying to make each other laugh and I simply prayed, "God, help to actually listen to whatever Mrs. Winans asks me..."
So I started repeating to myself ... listen ... listen ... listen ... because if I hadn't done that, I would have not remembered to actually listen to someone else's comments you know...haha! So, she comes up to me finally and says, "Hello there! I am so happy to have a white-brother auditioning for my show! What brought you out today? Why did you think you were right for the show?" I replied completely off the cuff and said, "Well you know, Vickie , I do have 12 black friends in Columbia, South Carolina, so I am pretty confident that I am READY for the BET Network!" She laughed and bent over and slightly covered the lens with her reaction and inside I was thinking, "Don't you mess up my shot girl!!" But outside I just smiled and then listened as she asked something like, "So what makes you different, what makes you special?" I then was grateful for such an opportunity to tell a little about myself. Not every comic would have such a chance. So I said to her, "Well, I taught at an Evangelical, Christian Private School for nine years. I was the head football coach and drama teacher there. Vickie , see if you can find another person in the country that was their school's varsity head football coach AND put on the school plays." She busted out laughing, reached her hand out and grabbed my arm and said, "Well, Marty, you are indeed a funny man!" Inside my heart was pounding with excitement, but I acted like I had been there before! I sat down near the back and was able to relax a little now. I started a conversation that would change the entire outlook on the purpose for why I was at this audition. I now believe I was at this audition for many purposes, but probably the main one was so I would be able to meet "Griff." It turns out, the original "Heckler" from the earlier debacle is actually one of the coolest cats I have ever met. He sat down at the table where I was. I initially was sort of scared, like he might be sitting down to make fun of me. Then we sort of made a few comments to each other about the comics and I could tell the guy was savvy when it came to critiquing comedy. I think I won him over when I made one comment about something one of the comedians said entering the stage. 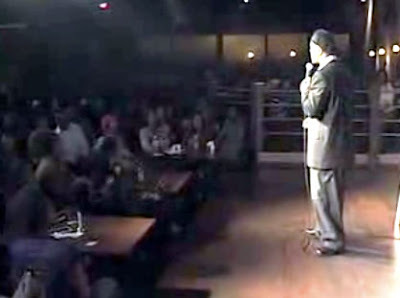 This comedian went just after Smokey Jones, who completely killed his 2 minutes, and this comic (who happen to be the third white guy) says, "Man, I guess I have to follow that...oh well, here goes..."
And I blurted out, a tad louder than I meant to, "Man, I would LOVE to go after that!" and I truly meant it. I love hitting the stage when the stage is lit up and hot! I assumed everyone did. When I said this, it was a little awkwardly loud, and Griff looked over at me sharply. I immediately felt pressure. Then he said, "THANK YOU!" and he leaned over from his chair and gave me the one handed fist bump gesture. I bumped him up and then leaned back in my chair. I continued to watch this white comic bomb. It was pretty bad. BUT, he was bald and had a gotee. So I leaned back up near "Griff" and whispered, "Dude, is that what I look like when I am on stage performing?" And I was serious. He scooched his chair back to be directly next me as he looked at the ground and chuckled and said, "No, dawg, not at all..."
Then he proceeded to say, "You know what I love about you dawg...and I really don't know how to say this without sounding mean ... but every white comic that I see work the black clubs...hmmm, I don't know man, they just um..."
And I interrupted with, "Try and act like Justin Timberlake?" And he was like, "YEAH Man!! But you, dude, you just got up there, and you don't even care that you're not cool, and I dig that about you man. When you said you were part of the staff, I was like, that dude is funny right there..."
Then he gave me what I think, to date, might be the highest compliment I have received from anyone "of-color." He said, "Yeah man, there's something about you, you just got this cool swagger about you..."
Before that Horace Sanders had said, "Yeah man, there is something in there, I think you got it, man." But Horace was nice from the get go. I had witnessed this "Griff" character completely mentally abuse a young man four hours earlier, so the juxtaposition of the two worlds made this comment have more impact in the short run. Then Griff and I continued to chat and discuss different aspects of comedy for a few minutes and a few other comics joined us including my guys, LG and Corie. It was turning out to be one of the best days I had had in comedy. Griff was up to perform. Griff murdered his two minutes. KILLED! Very funny story about two women in his church. This made me very happy for him and for everyone there. He seemed to me to be the hometown favorite. He is a local radio personality and a very solid Man of God. If you just met the dude you wouldn't really predict off the first impression that he would be such a solid fellow but, trust me, he is. Producer announces that we will have the call-back information announced in 30 minutes, so everyone stick around. Griff is grilling this one girl about her material. He is begging her to let him write some jokes for her. She was a Jehovah's Witness and he really wanted to write some jokes for her. I could tell he was actually serious too. We all cut-up for a few minutes trying to not talk about the actual gravity of the situation. Griff's antics helped pass the time for me. Producer comes to stage. She says, "OK, we have the call back list ready to announce. We are gonna call your numbers out. Please raise your hand acknowledging that you heard you have been called back. All performers tonight need to be back here at 7:45 and will perform for the club tonight. So here we go." My heart was at peace. I knew I had done my best. I knew God had brought me to Atlanta to meet Griff. I felt confident that I had networked with many other comics there that would ultimately help my room prosper at The Bistro. So I was completely at peace with the scenario. It did strike me funny how different black folks are from white folks though. They just kept everyone in the room and called out the numbers right there in front of everybody and made you raise your hand. I think a white group would have posted the list on the wall or something. White people don't ever like indicating how they actually feel for real! You ask any white person how they are doing they will respond, "I am fine," or "I am good." Even if they just came from their divorce attorney! If you ask an older black woman at the grocery store, just in passing, "How ya' doing?" She might say, "My hip is killing me!!" I wish white folks would take a lesson and lighten up a little when it comes to things like this. Anyway, she said she would call out only the number of the performer. So she starts, "7 ... 11 ... 19 ... 26 ... "
I think to myself, "Wow, LG, Corie, and I are numbers 2, 3, and 4, so NONE of us made it ..."
Then she says, "TWO." And I was genuinely very excited for LG. I may have clapped. Then she says, "THREE." My hand just sort of raised on its own. I heard a few other comics actually acknowledging me with claps (one or two others, not like a ton of folks clapping...") I then immediately teared up a little. I had no idea what it would ACTUALLY mean to me until it happened. I had just made the cut for the BET Gospel Comic View. Around 85 comics auditioned and a handful were getting called back and I was one of them. It meant a lot! She called a few more numbers and then called out Corie's number. So we pulled the hat-trick ... the tri-fecta. The Columbia boys were In-the-house! Griff had gotten called back as well, and when I was geeking out thanking everyone, I sort of blurted out to him, "What are you doing now?" And he said he was going back to his house, which was 17 minutes from here, and we could come hang there until the show. When I started to go and thank the producer, Griff haulted me and was like, "Bro, they didn't have nothin' to do with your success, your success is from God, you thank God, don't you thank those folks there. Ain't nobody in this room is pulling for you to do well. Everyone in comedy is a hater...You took someone's spot. You thank God brother, and let's go to my house and relax!" I immediately went to my van and followed Griff to his house. Although before we left, we confirmed that in the night audition we were going to be given FIVE minutes to perform. I was very excited about this extended amount of time! Griff pulls into a nearby gas station almost killing us all. I drive up next to him. He gets out and comes over and immediately makes fun of the fact that Corie and LG are in the back seats and no one is in the front seat. I try and claim that I set it up for them special to have great leg room for the trip. Like a chauffeur service. LG sells me out and makes fun of how he thought I didn't want them in the front or something...(I'll remember that next road trip, LG!) Griff gets LG to ride with him. We start for Griff's house. Corie is snoring loudly in the back seat as I follow Griff to his house. 5:15 p.m. - 5: 35 p.m.
Have cell phone conversation with my brother about the whole day. We each agree that in the five minute set I would tell the same stuff I had this morning and then add The Bug-Man bit to it to make my five minutes. I was VERY pumped about the opportunity to tell The Bug-Man on television. Bug-Man is a 3 minute story exactly. I can leave some parts out to make it 2:45 or so, but it would be a perfect five minute set with my two minutes I already planned. I could not have been happier about the material. Not exactly 17 minutes from the club in today's traffic evidently, we arrive at Griff's house. We meet Griff's daughter who brings him a crafty project of some sort to show off. It is butterflies and makes me think of my daughter back home. Griff's is 9 and mine is 9. We met Griff's boys too. They seemed like impressive young men. Griff had an amazing set-up downstairs. Sort of a shrine to all things ESPN. He had a vintage click-thumbs football game from probably 1981 or something. Remember those games with the little lights and you click up and down until a hole breaks open and then you click forward as fast as you can and when your little light gets to the far right of the screen it resets back to the left side? Anyone else remember those games? Griff explains to us that his real passion is Madden Football. He says something like, "God, family, comedy, Madden, Raiders." Don't get into it with Griff about his Raiders. He explained to us that he did a comedy event for the Denver Broncos' organization. A fundraiser event with Ed McAffery and while performing and running out with the guys - they were wearing their Broncos' jerseys, and Griff was wearing his Raiders jersey! We went to the local restaurant were Griff has his weekly "room." He was obviously well liked at this place. He was like Norm from Cheers there. Everyone knew him. While at dinner he gave me another high compliment. He asked, "So if you guys need to crash at my place you can. My wife knows that the bottom bedrooms are for any comics that are traveling through, so we got plenty of room. What did you all plan to do tonight?" I was like, "You know, we hadn't really planned it that far to tell you the truth. We basically were like, let's go audition and see what happens. I didn't even bring extra clothes or anything." He responded, "You really had no plan, no nothing?" I was like, "Nope, nothing..."
Then he said, "Duuudde, that's 'hella-cool' right there. I like yo' style..." And gave me another one handed fist bump. After about the fifteenth weird question I had for Griff he was like, "Dude, you're freekin' out, you need to chill. I went to the same audition you went to, man, I don't know any answers man...Just do material that you know is going to work!" I explained to everyone that I had just taken my meds. Start stressing a little that we may be late, but Griff insisted that he knew the Atlanta traffic and we would make it. Roll up into the Comedy Corner parking lot and are told we have to pay $15.00 dollars for parking! I tried to explain that we were the performers and he didn't budge. So, I guess, making the cut, doesn't get you free parking at the Uptown Comedy Corner! Wonder if Chris Rock pays for his parking? Sign in and realize the sign in sheet would serve as the order we would perform. This was a good thing to get to perform late in the set as it turned out. My college roommate shows up. James and his girlfriend came! The fun part about this is that James is my black college roommate that helped shape a lot of the comedy that I would be performing that night. He lives in Atlanta now, so it was extra special that he got to come out and see the show! He used to come to my plays in college so it really helped put me at ease. We are told by the producers that we have to pay for the buffet if we order food, we cannot mingle in the crowd or we are disqualified, and that we would only be given 2 minutes for our set. We are told that we would not have five minutes but two minutes right before we are to go on stage!! This was like being punched in the gut. I immediately went to a booth seat by myself and gathered my thoughts. I prayed. I said, "God, you have to be working through this somehow, what is it?" And an immediate peace came over me. I was sincerely grateful that we got 2 minutes instead of 3 minutes. Had he said three minutes, then I would have a true decision to make. I would always regret NOT telling the Bug-Man story if I didn't get a spot with whatever I did instead, but with 2 minutes I had no real decision I could make. I HAD to do my original set I had planned for this morning. The true blessing from this morning was that I blanked out and didn't give the last bit in the mix which contained the call-back. So the judges would see more range and everything would be great. The only problem now became my opener. I didn't want to tell the diversity thing to open tonight because it is not as good as the other stuff and it takes up about thirty seconds. If I remember my entire deal, I really wanted to make sure I got the call-back inside the 2 minute mark. The reason being that the producer had super-stressed the importance of ending in 2 minutes. He said he would jiggle the light at 1:30 and hold the light solid at 2 minutes. He said that when we saw the two minute light, we had better say, "That's my time, thanks!" and be done, or else we would most likely not be considered for a spot. I overheard bitter comics saying they would finished their last joke if they were mid-stream because they had said we had five minutes and that was unfair to do that to us like that. Who were they to stop us from doing our material! I was thinking that we needed to be a slave to the flashlight to prove we were ready for television. I cannot imagine on David Letterman they have much sympathy for young comics that push commercials back and hurt sponsors' opinions of the show, much less BET! Then, the producer explained, we had to use only the left side of the stage for television purposes. I assume so only the BET signs would be visible as opposed to the Comedy Club's wall, who knows. I overheard comics again bitterly saying, "I am gonna do my act, I don't care that they don't have their act together!" I was just thinking at this point in the game, it was not my role to coach these other comics up. It was my role to do my thing and do it to the best of my abilities! They announced the ordering. I would perform 21st out of 24 comics to go. I was excited. This would give me a chance to see everyone else go and get a feel for what goes on. It would also give me plenty of opportunity to feel out the audience and hear what they liked and didn't like. The only real question left for me was that of my opener. I have always maintained that The Code is one of my best pieces of material for a black audience, but I have also never liked starting out with it. It feels awkward to jump on stage, say, "Hi, I am Marty Simpson and I have always gotten along with black people..." But in a two minute set I was just not really sure. I knew I wanted to do The Code and my ending was very strong and called back The Code, so I just needed an opener besides the Diversity from that morning. My normal opener is a solid, very solid, short bit about my football playing days at South Carolina. However, I have never done that opener outside of my hometown, so I was really in a pickle. Again, I heard Horace's voice gently saying, "Listen to God, what's in your gut?" I sat down by myself and instead of listening to some of the comics I decided to pray. I prayed, "God, either you want me to start with The Code, which I think is a bad idea, or else you will bring me a better thing to say between now and when I perform." I was confident in my place spiritually. I was acutely aware of God's presence in the past few hours. I knew it was by his plan that I was even at this event. I therefore felt no pressure and completely at peace. Even though I thought The Code should not be a starter bit, I would do it if God brought me no suitable alternative. And by brought, I mean, brought to mind, or created for me on the fly. Either way was fine by me. 8:25 p.m. - 9:25 p.m. Comic after comic proceeded to really stink it up. While there were a select few funny comics scattered through, by in large the first hour of the show was dry and tired. I think it was a combination of two types of things happening. The first, was truly Christian Comedians so out of their element in the "club" scene that they were making jokes that would have played really well in a church crowd but were missing the mark with this audience, OR, second, they were "club" comics trying to tell their material in such a clean way that would get them on the show and they were floundering. The latter of these two was fun to watch happen, the former was awkward to watch and just made some of the other guys, Griff especially, angry. Griff wanted everyone to be killing! He wanted the Christian comedians to kill this "club" audience and prove that Christian comedians are just as funny. When the truth is they are, but not outside their element. Just like the "club" comics weren't funny when they were trying to be "clean." The show had a very distinctly weird vibe about it for the first hour. I think some of the comics were arbitrarily deciding to do different material from this morning to try and show the judges their versatility. BUT, we were all under the impression we would have more time tonight. I think some comics tried to squeeze their planned material into the 2 minutes. Here is a phone-snapshot of a picture hanging in Griff's hallway to his downstairs room. P.A. came to get the last group to walk us over to the on-deck area. We walked across the club and I saw James and he gave me the "good luck" look. I ended up sitting in the on-deck area right by Griff. I realized he was going to perform right before me and I was fired up about that. I knew he would kill this audience. I told him no matter what happened that day, that he had been a huge blessing to me either way. Griff kills his set. Unbelievable. Same set as this morning, but with a different vibe for a different audience. Griff is a real pro. I walk up the ramp. Everything goes into slow-motion for me. Through my eyes, it's like the scene in Superbad when they get off the bus and Seth is wearing the Waylen Jennings shirt. I hear the energy from Griff's set in the audience start to die as they see me walking up the ramp. The room starts to talk amongst themselves a little. Not in a rude way, but in a, "The white guy is going, we may want to go to the bathroom" way. I hear Horace's voice (like Obi-won) gently say, "Take the mic off the stand, put the stand behind you, then turn around and do your thing." I take the mic off the stand. I put the stand behind me. "Hello there ... My name's Marty Simpson ... I am talking in this voice, because this is the voice that all black comics use ... when they're makin' fun of white pee-pull ..."
Then I say, using my real voice, "The sad truth is, my real voice is really not that different, so let's just move on ..."
I don't know what it is, but I've just always gotten along with black people. Maybe cuz I played college football. Maybe cuz I had a black college roommate. But no seriously, I have always gotten along with black people, and I always wondered why, you know? But I have figured it out finally. Do you folks know The Code? Ok, white people, pay attention, I am gonna teach you The Code. No, no, no, white people that's it, that's the whole code. I am not saying I understand the black man. I am just saying I know the code and therefore I get along with black people. And who hear can tell me the Chief End of man? What is the biblical chief end of man? To glorify God and enjoy him forever, that's right. And it is for this reason, that white people don't dance in church. AND ... everybody's doing something different. And I am on a row near the front looking at the congregation wondering what to do. THANK YOU, I've been Marty Simpson, and Thanks James for coming out! I walk off the stage and down the ramp. At the bottom of the ramp is a 5 foot 2 inch, 110 pound, attractive black girl with a head-set on and a clipboard. I grabbed her and lifted her off the ground. Her ear was right at my mouth. I yelled into her ear, over cheers and applause (still), "I am so sorry I am hugging you! But you are the one standing here!" She responded, "It's all good...it's all good." I put her down and apologized again. I walked back to the holding area for comics and lay face down on the ground for about twenty seconds. After I get up off of the floor, I sort of hear the entire place erupting to everything Smokey Jones is doing, which makes me happy for him, but I didn't actually hear anything he said. I did notice that he clearly had the best audience response of the night in my opinion, but I was not bothered by that at all. I felt like I contributed to Smokey's success, the same way, Griff had contributed to mine. For the next half hour I was a rockstar. The PA's were loving on me. The other comics were telling me great set. Then Vickie Winans herself, found me on her way out, and said to me some very encouraging words that out of professional courtesy I will keep to myself. I then had a picture taken with Mrs. Winans, which is my current profile picture on facebook! When I started doing comedy nine months ago, Horace asked, "Marty, why are you doing comedy?" I told Horace that I was doing comedy for one simple reason. To prove to myself that I could. While it is obvious since then that God has revealed many other reasons why I am doing comedy, one thing is very clear to me as of this night. My high school football coach told us after we won the State Championship in 1988, that we would accomplish many things in life, and we would go through trials in life too, but no one, NO ONE, would ever be able to change the fact that for one day, for one season, we were the best. We were State Champs, and no one could ever take that away from us. I felt like I was saying that same speech in my head to myself for forty-five minutes after that 2 minute set. No one can ever take away from me what happened this night. No one. Because my single original goal in this "comedy journey" was simply to prove to myself that I could do it, it was clear now, that EVERYTHING I ever accomplish from this day forward in my comedy career, will be, from my perspective, GRAVY! Call Ashley, my wife, and tell her the good news. I spared her the entire story. I simply said, "I blew it up, honey, I really did ... " She responded, "We prayed for you twice!" 11:05 p.m. - 2:54 a.m. the next day. I spoke with three or four folks on the phone and had to tell this entire story to each person as I drove home. Bobby sends out a note to my facebook group (280 or so folks) telling everyone just enough to set-off a few dozen emails and a handful of cell phone calls while I am at work the next day. Tell Ashley I am home. She is already awake. She tells me I forgot to turn my auto-set alarm off so the 3 a.m. alarm from the previous day woke her up (again!). I give her the Reader's Digest version while we sit in the dark. She is very excited. Wake up. Go to work! 2:02 p.m. - 5:30 p.m. Waste at least half this time retelling this story and responding to facebook messages prompted by Bobby's email. At my show at The Watershed, I begin my set with THIS STORY. It's a 25 minute version of the story that gets really good laughs. I conclude that once I transcribe the story and edit it down, it will become a really nice 3-4 minute story and serve as strong material! Finished typing this blog entry and posted it to my blog page. At this time, all comics that I have contact with have not heard whether they made the show or not. One out of town comic called me assuming I was a "shoe-in" (in his words) to see if I had heard yet. So as it stands right now -- No one knows who made the show and who didn't. I still maintain that, while it would be a lie to say "I don't care," I truly have an awesome peace no matter what happens. Thanks for reading my dissertation. ** Smokey Jones Sermonette :: 9:20 p.m. on the 25th. Backstage, after Smokey had killed, he saw me and he went off on how funny my five minute open-mic had been. He was going on and on about how much he liked everything I had done. He was really pouring it on. I took the opportunity to give him my business card and he gave me a copy of his DVD. I challenged him about his spiritual material and about how he could really be an amazing Christian Comedian if he wanted to do that. He explained about how he was really thinking about it. How he had to go where he was getting paid to do comedy because it was his job. But I could tell God had already started working on him a little. I told my wife that night (six months ago) that maybe God's purpose for my comedy was not for an outreach to the audience, but maybe it was for an outreach to other comedians. My private prayer life would then include many prayers for Smokey Jones. So when I saw Smokey that day at the audition it was a real encouragement. Because, I hadn't noticed him in the audience. He called to me after my set and spoke with me. He had specifically remembered The Code. He brought me over to his people and introduced me. He showed me his bent up Blue-Eyed Panda business card in his wallet. He had just been in Columbia the previous week and had asked if I was performing that week. I had just that past Monday called The Comedy House to book an open-mic performance and Sharon said that some comics had been asking about me. I told Smokey he best be careful with his heart. If he let God get a hold of it, he could really do some unbelievable things for the Lord with his comedy. Smokey would perform that night just after me. Corie, Smokey, and I had a very encouraging prayer just before we all performed. Now, if you google or youtube "Chris 'Smokey' Jones" you will find some very objectionable material, but I truly believe God is a huge, sovereign, loving, God. I believe if God wants to get a hold of Smokey Jones he will. And I believe if he does, Smokey Jones will do unbelievable things for the Lord with his gifts. I recently attended my very good friend, Michael McFadden's, bachelor party. All the guys met in the Vista for some food before we all went to Jillians for ping-pong and maybe trivia.For some reason, I was bored enough to try something for fun. 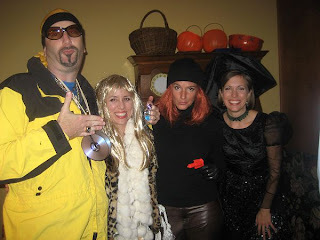 I decided I would wear my Ali-G costume out on this night and just play it off as normal no matter where I went. 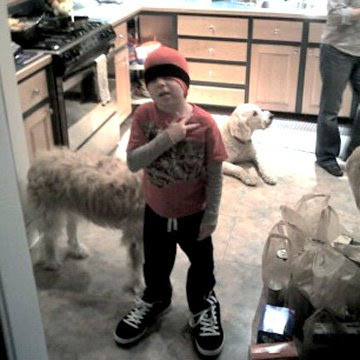 The night was filled with me posing for dozens of pictures as "Ali-G."
Then, two or three weeks later, I come home from work to find Walt, my son, dressed up sort of like Ali-G on all his own. We call my daughter Sonny . . .
My daughter is named Savannah Katherine Simpson. When she was a little girl learning to talk she could not say her name. The noise that came out when she attempted sounded like SAH-knee. We adopted "Sonny" as her nickname and it stuck. She is going to be a performer of some kind, that's for sure. 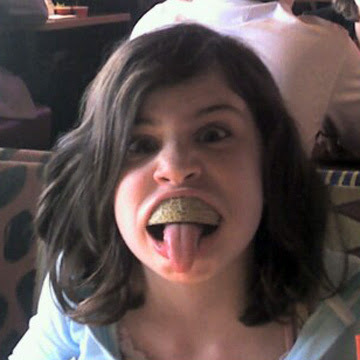 Here is a picture of a recent family lunch outing to Red-Robin. She is a natural!